I regularly use two tablets, a Nexus 9 and a Surface 3 and I also own an iPad 3. We use the iPad primarily for watching streaming video, and the Nexus 9 is my primary reading and couch surfing device. I’ve owned the original iPad, a Nexus 7 and an HTC tablet, so I have used tablets for a long time. Of all the tablets that I have used, the Surface 3 has been the most useful. The Surface 3 is flexible enough to meet a wide variety of use cases because it runs Windows 10 and a vast amount of desktop software. Consequently, the Surface 3 is valuable for both work and play. Because it runs Windows 10, I can connect the Surface 3 to my company’s email server and use Outlook. While I can also connect iPads and Android tablets to the same servers, you must use apps other than the version of Outlook that I regularly use. I can use it to access corporate intranet sites via a VPN and desktop web browsers. My main use case for the Surface 3 is taking notes in OneNote using the Surface Pen. The Surface’s ten inch screen makes it nearly as large as a sheet of paper, so I find it very comfortable for writing. I like writing notes by hand, and studies show that handwriting helps to retain information. By using OneNote I don’t have to carry a bunch of paper, and I can quickly search for notes due to OneNote’s ability to index digital ink. One way the Surface 3 has been optimized for taking notes is that clicking the button at the top of the Surface Pen, like you would a ballpoint pen, launches OneNote. The process mimics how you would pick up a pad of paper and click a pen to write. Double-clicking the Surface Pen button captures a screenshot and saves it in OneNote to annotate. If you own a Surface 3 I recommend buying the new Surface Pen because the new tips make for a very smooth writing experience. I think that Edge may be the best desktop web browser simply because it is really fast and renders pages beautifully. When I research information on the web, I can annotate a web page in digital ink and save a copy of that page in OneNote. The 10.52″ x 7.36″ x 0.34″ dimensions of the Surface 3 make it the perfect size for a productivity tablet. In my opinion 12 inches is too large for tablets because they are hard to use while just being held in your hands. You are not going to comfortably carry an iPad Pro or Surface Pro in ways that you can carry a Surface or iPad. While I expected to like the size of the Surface 3, I didn’t expect to find its built-in kickstand to be so useful. I prefer watching video on the Surface 3 rather than my iPad simply because I can stand it up in a good viewing position. I use the MLB At Bat, WatchESPN, and Netflix Windows Store (tablet) apps on the Surface 3. Other Windows Store apps that I use regularly are Mail and Calendar, which come with Windows 10, MyRadar, and the MSN Apps: News, Money, Sports, and Weather. The Surface 3 came with an Office 365 subscription and full versions of Outlook, Word, Excel, and Powerpoint 2016, but I prefer using the Word and Excel mobile apps with their simpler UI. As I wrote earlier, I am a heavy OneNote user, and because of that I use the Surface 3 as a tablet more than in “notebook” mode. I did buy the Type Cover, but if you walked by my desk you are likely to find the cover disconnected from the Surface 3 more than not. The Type Cover is, in fact, the source of my main problem with the Surface 3. For some reason Windows 10 seems to forget that the cover exists. Some times I see USB errors, other times the keyboard just will not work. I am sure there is a Windows 10 driver issue, ironic given the problem is Microsoft hardware working with Microsoft software. The solution is to restart the tablet, which is quick enough to tolerate. I occasionally have a similar issue with the Surface Pen; I will try writing on the tablet and nothing happens, the pen contact with the screen is not registered. Usually this problem is fixed by unscrewing the cap to disconnect the battery from the pen, which effectively resets the pen. Fortunately pen recognition issues happen much less frequently than the Type Cover issue. 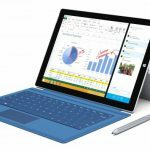 At the time Microsoft released the Surface Pro 3, their were rumors that Microsoft was going to release a Surface Mini that had a seven inch screen. Reports are that Satya Nadella cancelled the release of the Surface Mini on the belief it would not sell. The Surface 3 may not literally be the Surface Mini, but for all practical purposes it is, and I think the 10.5 inch screen provides for more functionality than a seven inch screen would. Given that the Surface 3 is now a year old, speculation will be whether Microsoft will release a Surface 4 and if they do what changes it may make. I imagine a Surface 4 could have a faster CPU, more memory, more storage, be thinner and lighter, but frankly, while all these would we welcome improvements I don’t find them necessary. In my opinion, the single biggest thing Microsoft could do to increase sales, beyond more marketing, is to lower the price so that one could buy the Surface 3, keyboard, and pen for no more than the $499 price they charge just for the tablet. Competing products from HP and Dell have such all-in one pricing, and frankly, if it had existed at the time I bought the Surface 3, I likely would have bought the HP Spectre X2. Bottom line, after a year of ownership, I am very happy with the Surface 3 and it continues to be important part of my personal productivity toolkit. If you are looking for tablet to increase your productivity, I recommend you consider the 2-in-1s like the Surface 3. This entry was posted in Experiences and tagged Surface 3, tablets. Bookmark the permalink.